Your coupon code will be automatically applied at checkout. Sorry, the limited time offer has expired, but you can still take advantage of the great offer below. * YES! Please send 2 Bonus Books for $5.99 - That's 50% off our regular price! No, thank you. 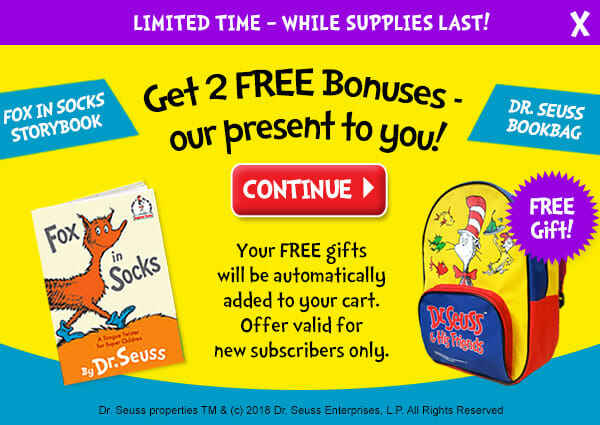 It's easy to share the gift of reading with your child We'll enroll you in Dr. Seuss and His Friends book subscription, and send you a Welcome Package with your 4 Dr. Seuss Storybooks for just $5.99. Shipping is FREE! Encourage a lifelong love of reading. 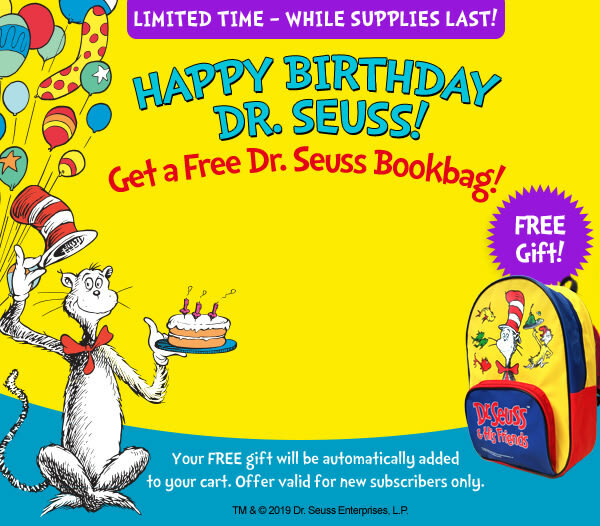 Then, about every 3 weeks (up to 17 times a year) we'll select a new set of 3 Dr. Seuss and His Friends books to send you for just $5.99 per book plus applicable shipping and handling. 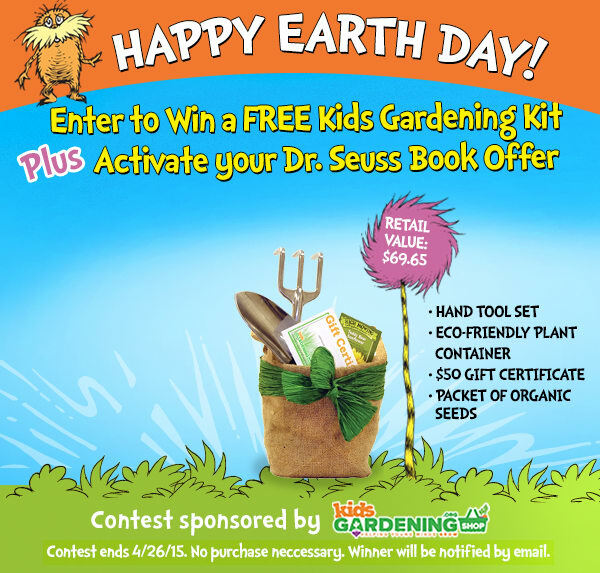 You will also receive up to 4 more seasonal packages a year which include Dr. Seuss books and related items like a calendar and Year Book. Those special packages will cost between $15 and $25 each plus applicable shipping and handling. Your satisfaction is guaranteed! We'll always send you an email notice before shipping any books and you can always choose different items or cancel a shipment by simply going into your online account or contacting us within 10 days of your receipt of the email. By clicking continue you authorize that we can charge the account you provided on the date of shipment. Of course you can cancel at any time. Orders are subject to applicable sales tax. If you are not completely satisfied with any book package, simply return it within 30 days of receipt. Please include your original invoice along with a note letting us know whether or not you wish to cancel your subscription. We will automatically refund the price of the books to the original payment method you used. At Early Moments there is never a purchase commitment. You may cancel at any time for any reason. Get an extra money-saving bonus by selecting Bonus Books! 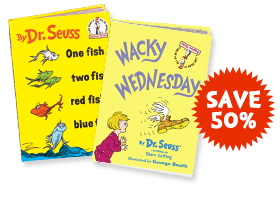 You'll get extra two Dr. Seuss and His Friends books for just $5.99 — that's 50% OFF our everyday low price - and there is no additional shipping and handling cost! This offer may be withdrawn at any time.  Limit: one subscription per household. Must be 18 years of age or older to order. Applicable sales tax will be applied. All applications to subscribe to Dr. Seuss & His Friends are subject to review. We reserve the right to request additional information, to reject any application, or to cancel any subscription. We reserve the right to alter or end this offer at any time. 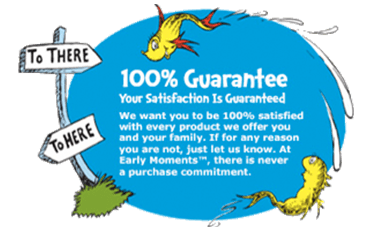 If you ever do not receive your notice about your shipment giving you 10 days to cancel that shipment contact us and we will provide return shipment. All books are subject to availability.